Just when you think you've seen it all, phone design-wise, somebody always seems to come along with something completely different. This time that somebody is O2, with a music-centred handset that combines the aesthetics of an eighties digital alarm clock (in a good way) with MP3 player, camera and, oh yes, mobile phone. 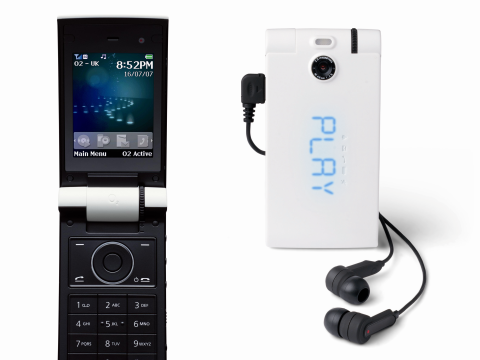 It's a neat little package on the outside of the clamshell, with curved white plastic sandwiching music player controls in black. Music controls consist of play, forward and rewind, with a chunky old-school scroll wheel on the hinge acting as the volume control. No need to open the phone to start the music player, you can get it all from the side buttons. There's also an FM radio with RDS info and 20 preset stations, though you'll need the supplied headphones to use it since they act as an aerial. So far, so what. But the Cocoon's can't-touch-this moment comes when you start playing tunes, and the track titles are displayed on a hidden blue LED display beneath the case which lights up on the outside panel to show a scrolling text display. The dot matrix style fits in perfectly with the retro-future flavour of the design - think 2001: A Space Odyssey and maybe that early scene in I, Robot, when future-phobic Will Smith wakes up in a room where all the technology looks late Twentieth Century but has mid 21st century abilities. The display also lights up when you receive a call or message and can display time and date info. Another trick is that it comes with its own 'Nest', a dock by any other name. It's designed to help it operate as an alarm clock (a survey by Nokia last year claimed that 72 per cent of us use our mobile as our alarm clock). It also doubles as a charger and there's an additional plug-in aerial which allows you to wake up to radio, if you don't feel you've any appropriate saved tunes to rouse you gently from slumber. Back to the design (it's hard to get away from it) and also on the sides is a brace of largish stereo speakers, which, although they're not particularly loud, at least sound a mite better than the average tinny phone player. The lack of volume seems to extend to the ringer however, which isn't particularly loud, and the vibration setting is a bit half-hearted too. It's also a shame that the supplied headphones don't quite rise up to the style bar set by the rest of the phone. They're nondescript looking black things that seem to have come from another device, though they have noise-excluding covers and sound perfectly fine. The music automatically cuts out when you receive a call, naturally, but you can also set it to play quietly in the background, offering a kind of ambient soundtrack to your calls. There's a MicroSD card slot on the side that can add an extra 2GB to the existing 2GB onboard memory, which should be enough for around 1,000 songs. A very reasonable capacity for an MP3 player (it plays WMA, MP3, WAV plus iTunes-friendly AAC and AAC+ formats by the way) but there's no additional MicroSD memory card supplied. Last of the side-mounted controls is an unusual little switch that pops out the battery cover - no need to scuff your thumbnails with this baby. Connection to PC or Mac is by USB and there's a simple drag and drop interface for transferring tracks or pics. Usefully, if you like to share, there's an adaptor that allows you to plug in two sets of headphones with a 3.5mm jack so you can groove with a friend. There's also stereo Bluetooth for wireless fans. Flicking through the menus, it has to be said that it's not the most exciting onscreen graphical interface, bearing in mind the originality of the casing's design. But it is clean and everything is where it should be. As well as standard tools like calendar and calculator there's also voice notes and a text notepad but it only comes with one game (EA Air Hockey) plus a couple of demos for Tetris and the Sims. life is good for a well-featured phone like this, with up to five hours of talk time and 15 hours of music playback, which at least keeps it up there with the iPod. And this being O2, there is of course a direct link to The O2 London venue with info, videos and free ticket offers. Speaking of which, the fast 3G connection means nippy WAP browsing and quick downloads, plus of course you can use it for video calls with the secondary VGA camera on the inside. The O2 Cocoon also supports HSDPA technology for boosting mobile broadband speeds on 3G to up to 3.6Mbps (for when O2 enables this across its network). The camera is a decent if not particularly outstanding one with 2 megapixels that will deliver up to 1600 x 1200 pixel resolution. There are the usual white balance and effects settings, plus timer (up to 10 seconds) and a real flash. The digital zoom however only allows for 2x at the high quality setting. The video camera offers good quality clips though, as well as 4x zoom. The only thing that really spoils the party is that there's no quick access button to the camera, and you have to search for it in the menus, which generally rules out those blink-and-you'll-miss-it quick snaps. Style-wise, the Cocoon is a hands-down winner, though its distinctive look and feel won't appeal to everyone. It's one of those style statements that will divide opinion quite strongly, we suspect. Fortunately it's not just a pretty face and its other features keep it nicely up to speed with most of its rivals - if you like the look, you won't be disappointed.